Eeee! 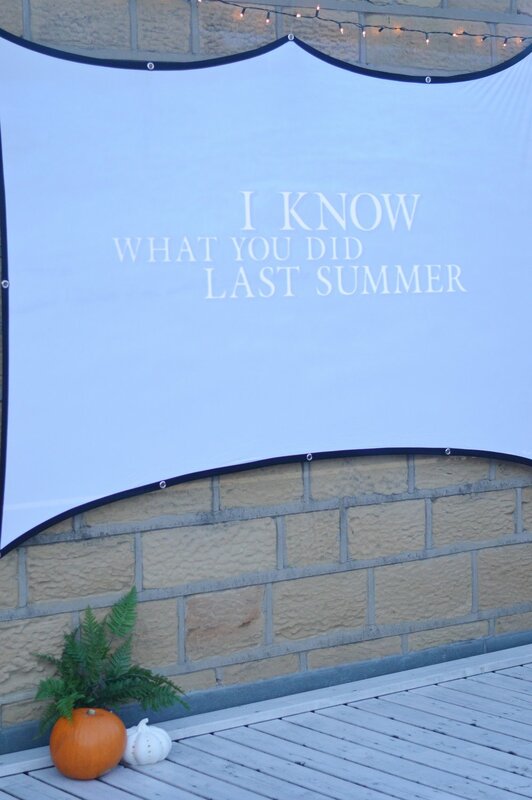 So let’s flash back to a couple of months ago, I was at an interiors party for No House Rules and they had an awesome projector set up in Katie’s back garden. There was also the opportunity to win the projector (which sadly I didn’t) but it got me utterly obsessed, so after a gin or two I mentioned to the AO team I have an incredible terrace and would love to have a movie night up there. Fast forward to a week ago and a lovely note and projector arrived in the post and I was beyond excited! The first task was to order the other things we needed as after standing on the terrace for a bit we realised that we would need something for the projector to go on, and of course a screen! We got this stand from Amazon, then this screen (which then actually bought a bigger one when we realised how large the picture can go!). The terrace has a plug point towards the back so thankfully we wouldn’t have to trail cables everywhere. The projector we were given was this one, I have actually seen this smaller one in use and was impressed with the quality. It was exceptionally easy to set up, we used our Apple TV hooked up with a HDMi cable and thankfully our wireless stretched out here. The picture was crystal clear, wish we had spent a bit more time tying up the screen to it was super tight and straight but I was just too excited and getting annoyed with Michael! We got to light the fire pit for the first time (which is from here) and whilst the sun was setting (and we were failing at keeping the fire alight) we chose to watch I know what you did last summer and then Fantastic Beasts. If it was up to me solely we would have watched all the harry potters but by 9pm, the fire had died and we decided it was time to come in. We bought the new screen and an outdoor heater straight away and I can’t wait till we can get out there again! Whilst we used the apple TV you could easily use laptop/Firestick or dvd player. If you have any other questions about the tech side let me know and I will ask our in house technician Mr Miller. Films and TV have always been part of my safe space, I watch them when my anxiety flares up, when I want to feel cosy, scared or have a good laugh. I love watching films with other people as a social occasion and I can’t wait to invite my friends round, though I think a lot may wait till it gets a bit warmer again! If we have more people we will have to sort a better speaker situation, as it was just the two of us we just used the speaker that was inbuilt in to the projector (which was loud enough but not too loud the neighbours would be annoyed) but the projector does have an audio jack, but I do wonder about wireless headphones potentially? We were so lucky with the weather, and after a really anxious time lately it was so nice sitting up there with the fire going, the sun setting and under a layer of blankets feeling totally lucky and happy. So if you were setting up a film night, which film would you show? You can only pick one! I am feeling Lost Boys for the next one which hopefully will be on Halloween, rain dependant!